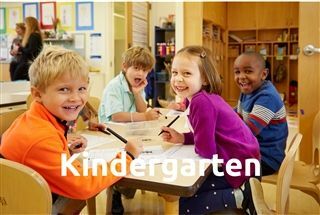 "The Early Childhood program is guided by a developmental approach to teaching and learning. It is our strong belief that children are social, confident, capable and creative thinkers. We believe that exploration is a child’s way of learning and that learning is an active, ongoing and experimental process." Inquiry is at the heart of our teaching and learning in Early Childhood. We encourage children to wonder and explore, to step into the unknown, to take risks and to be unconstrained by right answers. Teachers pose questions to help children connect to previous learning, to engage conversations and to deepen and extend understanding. Our curriculum is deliberately designed to develop our students’ intellectual capacity and nurture their insatiable curiosity. We stretch our students and offer them opportunities to innovate, create and play together within a community of learners. 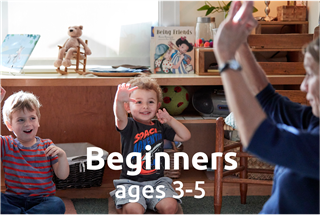 Learn more about our Beginners (Threes & Pre-K) and Kindergarten programs and schedules. In Early Childhood we are passionate about children believing in themselves and their great potential. We encourage children to work independently as well as collaboratively and to understand that they are the primary directors of their own learning. We devote time every day to creating a classroom community where children feel welcome, valued, known, seen and heard. We guide children to further their respect for the rights of others; and most importantly instill a lifelong passion for learning. Our teachers are passionate about what they do and believe fully in the mission. We are a place where imagination and curiosity is valued and childhood respected. Enter our space and listen to the language our teachers use with the children. You will hear the language of encouragement, support, stretch and challenge. They use phrases that develop a child’s intrinsic motivation- words that support a child’s developing sense of self. “Give it a go. You did it! Wow, you must be so proud.” We believe vehemently in the word, "yet." We know that children need to believe that we see their great potential. We strive to create space for children to see and celebrate what they can do and to help children see and work towards the development of new skills and accomplishments. Teachers intentionally prepare a space that will excite, invite and encourage children to explore. The classrooms provide opportunities for cooperative experiences in large and small groups as well as independent discovery and investigation. The environment is always suggestive and never prescriptive. The children are encouraged to take risks in a safe environment where relationships are built on trust. Learn about our Exploratory Lab and 75-acre campus. Beginners celebrated the arrival of spring with a dance around the maypole. “Hooray, Horray for the Month of May,” they sang during this time-honored school tradition. New Canaan Country School Beginners put on their annual Lantern Walk celebration with shadow puppet plays and a lantern walk. The evening was a much-anticipated event which culminated a study of light and dark. View photos. Kindergarteners celebrated Cuba this week through music and dance. They sang “Guantanamera,” the country’s most popular song and danced the Salsa, a dance that originates in Cuba, as part of their celebration of the Caribbean country. Even parents joined in on the fun (view a video). 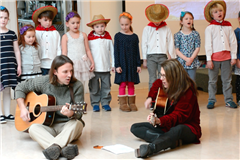 Kindergarteners put on sombreros and fancy dresses and danced the Cumbia, a traditional Colombian folkdance, as part of their celebration of Latin American culture (view a video). I spend a lot of time thinking about your children, about our Early Childhood program and about the mission of our school. I think about how what we do here in these early years influences each child’s experience across the divisions and beyond the fields that surround Grace House. The Exploratory Lab in Early Childhood is a space where play intersects with elements of art, science, design and engineering. A place where children ages three to six are invited to explore materials, test hypotheses, discover connections and construct knowledge. The sounds of summer are distinctive. The chorus of birds at dawn, the buzz of the bees in the garden, the crack of the baseball bat connecting with the ball, the peepers singing at dusk, the chime of the ice cream truck, the deep pitch of the ocean waves. But it is the hum of children during the months of summer that always leaves me most attentive.